A Welshman born in Pontypridd, initially played for Ton Boys Club before making two senior league appearances for Swansea Town during the 1934-35 season. He then featured in nine senior league appearances and scored one goal for Port Vale in the 1935-36 season. Moved to Macclesfield from Northwich Victoria where he had played in the 1936-37 season. Sammy featured regularly in the 1937-38 season and was noted for his 'flying runs'. Filled the inside-right position for much of his time at the Moss Rose but moved to other forward positions as required, including the inside-left position from February to May 1938. His registration was terminated in November 1938 due to disciplinary action, when he moved to Hurst. During the Second World War he served in the Royal Inniskilling Fusiliers but lost his life on 2 August 1943 at the age of 31 during the Allied invasion of Sicily. He is buried in the War Cemetery at Catania, Sicily. Made two substitute appearances for Hayes and Yeading during the 2008-09 season before signing non-contract forms with Poole Town in September 2009, moving on quickly to Dorchester Town (October/November 2009). Signd for Sutton United for the 2009-10 season spending time on loan at Walton & Hersham in January 2010 and then moved to Uxbridge for the 2010-11 season. Played for Nea Salamis Famagusta in Cyprus and, on returning to England, for Dulwich Hamlet where he scored six goals in his first 12 games in a season cut short by injury. Signed for the Silkmen in the summer of 2012 but was faced with stiff competition for a midfield berth. Spent time on loan Workington at the start of the season but, on his return, did not even feature as an unused substitute until his debut which came when he was the only senior player when members of the youth team were used to fulfill the second round Cheshire Senior Cup tie. He made a last minute substitute appearance in the next match at Lincoln City and was an unused substitute for the following two matches. His contract was cancelled by mutual consent in March 2013. On leaving Macclesfield he signed for St Neots Town and went on to play for several clubs - Bishop's Stortford (2013-14), Kingstonian (Mar 2014) on dual registration forms with Bishop's Stortford, Hendon (2014-17), loan Metropolitan Police (December 2015), Edgware Town (March 2017), Beaconsfield (summer of 2017) and Potters Bar Town (October 2018). Dale, of Congleton, first appeared for one match in the 1907-08 at centre-back but did not feature again until the 1911-12 season. He was then in and out of the senior team throughout the rest of his time at the Moss Rose and also played for the reserve team. He played at inside-left, but as there was strong competition for this position it probably explains the reason for his intermittent appearances, however, during the 1913-14 season he moved from the forward line to defence until Johnson was signed in December 1913. Featured from time to time in the senior team and then as a member of Macclesfield's reserve team in the 1886-87 season. He worked for Lonsdale Adshurst Brewery for 57 years, initially as a traveller and then as a cashier. After being a member of the Riflemen Volunteers for 21 years he was awarded a long service medal. He was also a useful athlete winning prizes in both the half mile and mile events. William died in October 1944. Previously with Port Vale, Daley signed for Macclesfield in the summer of 1919 and went straight into the side. He featured regularly throughout the season missing few matches, was the team's penalty taker and gained a winners' medal in the Altrincham Cup. Signed from Manchester North End in the summer of 1924 but only appeared in the first three matches of the season. A member of the Community Sports Trust Football Education & Training Academy who was a member of the team in the first round of the Cheshire Senior Cup. 17 year-old Nathan, a central midfield player, is technically gifted with a good engine, breaks up play well and is creative when moving forward and has goal scoring ability. Also featured for the Manchester Central Under-21 team during the 2015-16 season. Brought from non-League Eastwood Town by Crewe Alexandra for a fee of £20,000+ in May 2007, the midfielder only made 17 appearances for the Railwaymen before being loaned to the Silkmen for the final eight matches of the 2008-09 season. Having been released by Crewe, Colin joined the Silkmen on a permanent deal in the summer of 2009. One of the side’s most consistent performers during the 2009-10 campaign, Colin filled the wide left midfield berth scoring three goals, including Macclesfield’s Goal of the Season, a 35 yard stunning strike in the home match against Crewe Alexandra. Colin continued to feature regularly in the 2010-11 season scoring eight goals, two which came in the 4-2 victory at Gillingham in the penultimate match of the season. Missing the start of the 2011-12 season following an operation to cure a hernia problem, Colin then featured regularly usually as a midfielder, but because of the side's injury crisis, filled the striker's role from time to time. He scored Macclesfield's last Football League goal, a brilliant strike, to earn a draw in the home match against Crewe Alexandra. Colin likes to be known as ‘Junior’. Colin moved to Mansfield Town for an undisclosed fee in the summer of 2012 and then to Port Vale in the summer of 2014 going out on loan to Mansfield Town in 2016. Signed for Blackpool in the summer of 2016 moving to Peterborough United in May 2018 and Burton Albion in January 2019. Featured regularly in the first half of the 1911-12 season including playing in both the Healey Charity Cub matches. It is assumed that he left the club in January 1912. Another reserve team player who was given a senior appearance after the Silkmen had clinched the League Title. On 1 November 1954, George played in goal against Stalybridge (at Ashton United) in the Ashton Floodlight Competition, as Jack Hacking was stranded in fog. This was Macclesfield's first experience playing under floodlights with the match finally getting underway at 21.10. George had retired from playing football in 1947 and had never filled the goalkeeper's position having been a half-back in his playing days, however, he had experienced playing under floodlights on the continent in 1938. In the match he kept a clean sheet having saved a penalty which the referee had ordered to be taken a second time. During WW2 George was a corporal in the RAF and served with the British Liberation Army but before his war service he had been a prominent darts player in Macclesfield. George was the licensee in Macclesfield at the Fox and Grapes, Pitt Street and then at the Evening Star Inn. Nigel was well known in local soccer circles having played for Macclesfield British Legion and Knutsford. He got off to a good start scoring on his debut. Signed from Workington, Malcolm had also played for NPL sides Morecambe and Lancaster. George started his football career on the books of Everton. He then played at Runcorn for two seasons before moving to Chester where he was a member of their reserve side, and signed for the Silkmen in the summer of 1954. Most of his appearances came towards the end of the season and was generally used when Cyril Davies was either unavailable or was playing in a different position. Before signing for Macclesfield Carl had played for Bolton Wanderers, Preston NE, Stockport County and Wigan Athletic where he scored 48 goals in his last season with them. 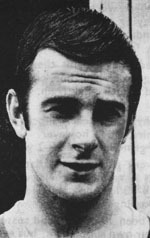 A prolific scorer for the Silkmen, Carl scored on his debut and was top-scorer with 46 goals in all competitions in the 1965-66 Season. He also scored seven hat-tricks during his time at the Moss Rose. Ran his own tailoring business in Bolton. With current first choice 'keeper Yoxall injured and reserve team 'keeper Greenall unavailable following the death of his father, amateur 'keeper Davenport took over the gloves for the Silkmen's worst defeat of the whole season when Stalybridge scored eight goals without reply. It was when Peter was playing for Cammell Laird that scouts from Nottingham Forest spotted his ability. Forest offered Cammell Laird a brand new football kit if they could sign Peter, to which they reluctantly agreed. Peter remained at Nottingham Forest from 1982 to 1986 and was their leading scorer in both 1983-84 and 1984-85. Whilst at Forest Peter was capped for his one and only senior international appearance for the friendly against the Republic of Ireland on 26 March 1985. He was signed by Manchester United in March 1986 for a fee of £750,000. He made 92 league appearances and scored 22 goals during his two years at United, with 14 of his league goals coming in the 1987-88 season when he was top-scorer with 16 goals in all competitions. He moved to Middlesbrough in September 1988. where he remained until the summer of 1990 when he signed for Sunderland. Leaving the old Football League, Peter spent some time in Scotland playing for Airdrieonians in 1993-94 and St Johnstone in 1994-95. He then spent a short time at Stockport County in 1995 before signing for Southport in the same year where he had a short time as caretaker manager. Peter signed for Macclesfield during the 1996-97 season and played his part in the Silkmen's Conference Championship season, and gained a winners' medal in the Staffordshire Senior Cup. He scored his 100th League goal in the final match of the 1997-98 Football League campaign at Exeter City, also gaining a winners' medal in the Cheshire Senior Cup in 1998. Peter was appointed first team coach the following season, moving up to the assistant manager’s position in March 1999. He was appointed manager on the departure of Sammy McIlroy in January 2000, but Peter never really enjoyed outright success (the team completed the 1999-2000 season in 13th position) and when he was asked to work alongside the Director of Football, he decided that he could not agree to this request and left the club in December 2000. Since then he has furthered his managerial career at League of Wales sides Bangor City (2001-05) and Colwyn Bay (2006-07), then returned to Southport (2007-08) and finally as assistant manager at Bradford Park Avenue for a short period in 2010.. In 2010 Peter auctioned his collection of paintings raising a total of £13350 to fund a new interest in railway posters. Peter has a Sports Science degree, has been a primary school classroom assistant, now works as a school cover supervisor and coaches rugby at his son’s school. Made just one appearance during a season when numerous players were given a one match trial and not signed by the club. The difference here is that this player scored two goals in the 3-1 victory and was not called upon again. A very experienced and well travelled player who had featured for very many teams before making the move to the Moss Rose. A Scotsman born at Armadale his career started at Third Lanark (May 1899),then moving to Glossop North End (November 1899), Manchester City (March 1900) for a fee of almost £300, Reading (May 1901), West Ham United (December 1902), Luton Town (February 1903), Fulham (August 1903), New Brompton (October 1903), Kilmarnock (January 1904), Southall (July 1904), Stockport County (March 1905), Atherton Church House (September 1905), Wigan Town (January 1906), Bolton Wanderers Reserves (July 1906), Colne (November 1906), Nelson (December 1906), Clyde (February 1907), Leyton (August 1907), Brynn Central (November 1907), and Gainsborough Trinity (November 1907). He was with Macclesfield for the final 10 matches of the 1907-08 season when he was only on the losing side for two matches, the team finishing the season in excellent form. He scored on his debut and in each of his first five matches. In line with his previous career his stay at Macclesfield was short continuing his nomadic experience going on to play for several clubs; Lancaster (July 1908), Denton (February 1909), Bangor City (April 1909), Prescot Wire Works (August 1909), Garston Gas Works (October 1909), Skelmersdale United (November 1909), Aberdare (January 1910 and Mardy (March 1910) where it would appear that he ended his playing career. Died in Bolton in 1929 at the age of 51. Started his career at Kirkdale FC before moving to New Brighton (August 1928), Southport (September 1931) and Blundlesands (March 1932). Signed for Macclesfield in the summer of 1932 and played in early season matches but lost his place at the beginning of October when Simms was signed, however, he made two further appearances later in the season. With Macclesfield for one season, initially filling the left-half position in the reserve team but after five different players had been tried out in the senior team at left-half was promoted at the beginning of November and was ever-present from then until the end of the season. Match reports stated that his positioning was good, he was quick on the ball and smart in tackling opponents. Given a five match trial when he took the place of J Crawford who regained his position shortly after. Had previously been on the books of Bristol Rovers, Wrexham and Bangor and had represented Wales at junior level. Given a one match end-of-season trial in the penultimate match. Previously with Nantwich, at the Moss Rose he was a versatile defender who spent most of his time as a central defender, although in the latter part of the 1938-39 season he played in the left-back position. Also played in the 1939-40 war-time Macclesfield team. Previously with Port Vale he signed for Macclesfield in the summer of 1925 going straight into the senior side where he played regularly at centre-half until December. He then missed several matches probably because he had not fully recovered from an injury sustained at the end of November. He initially returned for the second round Cheshire Senior Cup match in February but did not return permanently until the end of March and then at right-half, remaining there until the end of the season. Started his career at Alderley and then played for the following clubs - Hurst (1913-16, 63 appearances and one goal), Manchester United, Manchester City, Bolton Wanderers (1919-20, eight appearances and one goal), Bury (1921-22, three appearances) returning to Hurst (1922-27, 216 appearances, 24 goals). Signed for Macclesfield in the summer of 1927 making his debut in the first match of the new season scoring the only goal in the 1-0 victory. His last match for Macclesfield was ironically at Hurst on 22 October 1927 when he scored the third goal in the 3-4 defeat. Ran a successful electrical contracting business. A native of Shrewsbury, however, his wife, who hailed from Stoke persuaded him to move to the Potteries when, after demobilisation he joined Stoke City where he scored five goals in his first Central League match. He failed to reach the first team and after time at Flint Town and Witton Albion moved to Port Vale where he played at half-back. Although signed by Macclesfield from Stourbridge as a defender, he moved into the forward line where he became a free-scoring striker bagging several hat-tricks. 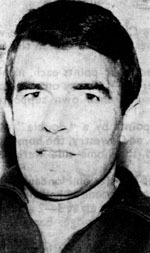 On leaving Macclesfield joined Ashton United in September 1963 where he played at half-back throughout his single season scoring nine goals in 36 appearances. He was employed as an electrical engineer by an office equipment firm. A local lad and son of a former Macclesfield player, Cyril initially played for Northampton reserves. During the Second World War he served in the RAF and played for teams around Rugby during 1944-45. On his transfer to Cheadle, Staffordshire he was captain of the unit's team in the Longton League. Cyril had the honour of being chosen for a Combined Services team who played against Czechoslovakia. During his time with the Silkmen Cyril was described as a cool, resourceful and clever player. He signed for Macclesfield in 1946 and was a defender for his first four seasons playing at left-half although he was the side's right-half in 1947-48. On the arrival of Walter Shepherd he moved to the outside-left position replacing Ken Speak, a position which he made his own. A regular in the team for much of his playing time, he was virtually ever-present from 1946 to 1950 and was ever-present in 1952-53 when the side were Champions of the Cheshire League. He gained a Challenge Cup winners' medal in 1948 and three winners' medals in the Cheshire Senior Cup in 1951, 1952 and 1954. He notched up his 400th appearance in February 1955 when he was made captain for the day. On 23 April 1951 a joint Testimonial match for Cyril and William Bardsley was held when Bury were the visitors, from which they each received £150. When he retired from playing he became the team’s coach having passed the FA’s preliminary examination, however, Cyril was called out of retirement when he played in his last match for the Silkmen on 21 November 1959 at Mossley. In his schooldays Glyn played for the County School of Flint. On leaving school he spent half a season with Rhyl Athletic before signing for Liverpool Marine where he remained for two seasons. He then moved to Prescot Cables before signing for Macclesfield in the summer of 1934. Glyn had gained several honours before arriving at the Moss Rose, these included two schoolboy medals, he had represented North Wales Amateurs, held two Lancashire Amateur Cup winners' medals, two Flintshire Champions medals and a Runcorn Amateur Cup Winners' medal. Simon started his career with Manchester United, progressing through the youth team to the senior side gaining Premier League and European experience, and representing Wales at under-21 level on six occasions. He then moved to Luton Town in the summer of 1997 for a fee of £150,000 signing for the Silkmen in December 1998. Playing on the left wing he displayed skill and strength, but despite his pedigree Simon lacked consistency in his overall performance but, amazingly, scored his first goal for the Silkmen on his return to Luton Town. Gained a winners' medal in the Cheshire Senior Cup in 2000. Simon left the club in the summer of 2000 and had a short spell at Rochdale before moving to League of Wales Clubs Bangor City, Total Network Solutions and Rhyl. Signed as a player for Chester City in 2006 moving to Airbus UK in 2007. Simon then joined the coaching staff of Chester City and took over as manager on the departure of Bobby Williamson until November 2008. Shortly after he returned to Chester as youth team manager. Moved to Manchester City where he was responsible for the Under 16s team before being promoted in 2013 to the Under 21s team where he assisted Patrick Vieira until May 2015 when Vieira moved to New York, Simon was then appointed Head of the Elite Development Squad. With the appointment of former Macclesfield player Paul Harsley as Head of the EDS Squad Simon was appointed Head of Coaching U13s to U23s in June 2018. Signed from Port Vale, Davies appeared fairly regularly until the end of November. He scored on his debut and also scored two goals in the 4-2 home win against Nantwich in November 1919. Previously with Port Vale's YTS scheme, Jason was signed by Rochdale in the summer of 1989 where he made 46 appearances. In the summer of 1991, at the age of 22, he moved to Macclesfield on a free transfer but was unable to establish himself in the starting line-up with most of his appearances coming from the substitutes' bench. At the time of his move to Macclesfield he started work as a coalman. After a single season at the Moss Rose he initially signed for Leek Town but after only a short time moved to Stafford Rangers in 1992. A Welsh amateur international who played for Caergwrle Town before signing for Macclesfield in February 1938. He made only one senior appearance despite being described as a speedy and confident player. Also with Chester from March 1938. There is no information recorded for this player who featured in Macclesfield FC's pre-league days, however, it would appear that he moved to Northwich Victoria for the 1889-90 season. A amateur player from Stockport who only featured twice, with his goal coming in the 3-4 defeat at Congleton in April 1938. A member of Macclesfield's reserve team who made three senior appearances at right-back during October and November 1902, and two appearances at outside-left in March 1903. There is no information recorded about this player who only featured in early season matches. In the report for the home match against The Vale of Leven on 1 January 1887 it states that Dearden came from Lancashire to help the team. Other than that statement there is no other information recorded about this player. After progressing through the Macclesfield youth ranks, Tim was given his first professional contract in the summer of 2005. He only made three senior appearances, the first when replacing the injured Alan Fettis in the home match against Chester City when he kept a clean sheet, and the second in the unbelievable 5–4 victory at Wycombe Wanderers. Tim was released in the summer of 2006 when he moved to Stockport County. Subsequently he has played for Barrow, Gateshead and Bradford Park Avenue leaving them in April 2013. Tim then embarked on a series of moves back and forward between Northwich Victoria and Altrincham. He signed for Northwich Victoria for the 2013-14 season but moved to Altrincham in February 2014. Having made no appearances at Altrincham he returned to Northwich Victoria for the 2014-15 season, yet again returning to Altrincham in the summer of 2015. Tim was unexpectedly released by newly appointed Altrincham manager, Neil Young, in the summer of 2016 despite winning the Supporters' and Players' Player of the Season awards for the 2015-16 season. Joined Guiseley for the 2016-17 season but following Young's resignation rejoined Altrincham at the beginning of September 2016. Having helped Altrincham to become champions of the Evo-Stik NPL Premier League in the 2017-18 season, at the age of 32, Tim decided to end his playing career. An amateur player who scored six goals on his debut for the reserves. Although he scored two goals in his short time in the senior side, he faced competition from top scorers Clowes, Leaver and Scruton, and made the last of his appearances in December 1957. Ahmed started his career as a trainee at Leicester City and then made five appearances for Peterborough United. Since then he had been on the books of a variety of non-League clubs including St Albans, Aldershot and Bishops Stortford. A summer 2008 signing, the left-back was in and out of the side, although he had an extended run towards the end of the season. He was released in the summer of 2009 when he signed for Barnet and has since played for Hayes & Yeading United, Dulwich Hamlet, Cambridge City, Thurrock returning to Dulwich Hamlet in 2012. He left Dulwich Hamlet in 2014 when he signed for Aveley but retained his interest in Dulwich Hamlet working in their Football in the Community section. In 2016 joined Kent Football United as a player/coach and in 2017 became a member of the Weston Football Academy. Has represented Sierra Leone, including their unsuccessful 2010 World Cup qualification. Joined the newly formed Macclesfield Town Under 21 Development team at the start of the 2017-18 season. Appeared in the only Cheshire Senior Cup match of the season when members of the Development team were used to fulfill this tie. Signed for Wythenshawe Amateurs in March 2019. Previously with Sandbach Ramblers, he took over the right-back position from W Brown, retaining the position for the remainder of the season with the exception of a few matches which he missed through injury. Whilst commencing the 1928-29 season at right-back, his place was taken by S Cheetham, but he returned to the side for the second half of the season filling the left-back position. His sole goal for the Silkman came in the 4-2 home victory against Northwich Victoria in December 1928. Despite the number of appearances made, he was described as the team's 'reserve'. Although born in London, Stelios is of Cypriot descent and has spent much of his career in Cyprus. He started in the youth section at Apollon Limassol before signing his first professional contract with Nikos & Sokratis Erimis (July 2009-July 2010, 23 League appearances) then moved to Aktritas Chlorakes (July 2010-July 2011, 23 League appearances), and Apollon Limassol (July 2011-July 2012) spending time on loan at Ermis Aradippou (January – July 2012). His next club was in Bulgaria where he signed for Lokomotiv Plovdiv (July 2012 – January 2013, 11 League appearances) but was released and was without a club until July 2013 when he returned to Ermis Aradippou in Cyprus (July 2013 – February 2015, 37 League appearances), where he was a member of the victorious side in the Cypriot Super Cup in 2014. Remaining in Cyprus he signed for Akropolis IF (February 2015 – August 2015, five league appearances) and the moved to Doxa Katokopias (August 2015 – January 2017, 46 League appearances). Leaving Cyprus he signed for Scottish club St Mirren (January 2017 – July 2018, 35 League appearances) moving to Ross County in July 2018 (nine League appearances) but was released by them in January 2019. Signed for Macclesfield town in the January 2019 transfer window. At international level has made nine appearances for Cyprus Under 21 side and to date a single appearance for the senior side. Mark commenced his career as an apprentice at Manchester United where he made one senior appearance having signed his first professional contract with United in 1982. Whilst at United he spent a short spell on loan at Swindon Town in 1985. He moved to Sheffield United in 1986 making 63 league appearances and scoring eight goals. In 1988 he was on loan at Chesterfield. Three years at Rotherham United from 1988 to 1991 saw him make 75 league appeaances and score seven goals before signing for Macclesfield in the summer of 1991. An enthusiastic player, Mark played his part in the Silkmen’s FA Trophy run in 1991-92 and gained a Cheshire Senior Cup winners' medal in 1992 before moving to Buxton in November 1993. He subsequently played for Altrincham, Buxton, for a second time, Frickley Athletic, Gainsborough Trinity, Maltby Main, Alfreton Town and Radcliffe Borough. On retiring from playing Mark took up a post as a youth coach at Manchester United before moving to Norway in February 2009 taking a post in youth development with Tromso IL. He moved to Molde in November 2010 as part of manager Ole Gunnar Solskjaer's backroom staff. On Solskjaer's appointment as manager at Cardiff City in January 2014 Mark followed him there again as a member of the back-room staff. In 2016 was appointed manager at FK Haugesund but resigned in July 2016 moving to top-flight Swedish team Djurgarden as manager in August 2016. In December 2016 he returned to Molde as assistant manager and was appointed manager at Start in December 2017 but after a poor set of results was dismissed in May 2018. Appointed manager of Norwegian Second Tier club Kongsvinger in June 2018 but had to leave them for health reasons. Joined up again with Solskjaer, when he was appointed interim manager at Manchester United, in December 2018 as a member of the coaching staff. Kristian featured regularly on the Youth team score sheet and made his senior debut from the substitutes’ bench in the 80th minute on New Year’s Day 2008. He signed his first professional contract with the club in the summer of 2008 but never established himself in the senior side with all his appearances coming from the substitutes’ bench. He scored his sole senior, and winning, goal in the home win against Barnet in April 2009. He was released in the summer of 2010 subsequently playing for Woodley Sports, Mossley and Curzon Ashton. Having scored 46 goals for Curzon Ashton during the 2012-13 season he moved to Stockport County for the 2013-14 season. Returned to Macclesfield in the summer of 2015 on a season long loan from Stockport County. Kristian quickly established himself as a prolific goalscorer reaching a tally of 24 goals in all competitions by the end of December 2015. In November he was named Vanarama Player of the Month having scored in every match, his eight goals including a hat-trick in the 5-2 win at Woking in the Vanarama National League match. Unfortunately he suffered a loss of form in the second half of the season coupled with an ankle problem he only managed to score a further five goals. Nevertheless he completed the season as top scorer with 29 goals in all competitions, the highest number of goals scored by a single player since Steve Burr's 35 goals in the 1987-88 season. Kristian returned to Stockport County at the end of the 2015-16 season. Having come to the end of his contract with Stockport, as a free agent signed for Football League side Chesterfield in the summer of 2016 moving to Notts County for a substantial undisclosed fee in May 2018. On the last day of the January 2019 transfer window signed loan deal with Grimsby Town. Initially played for Ashton PSA and Denton before joining the army during World War One, during which time he featured for Birkenhead Comets, Linfield and Tranmere Rovers. After the war he signed for Stalybridge Celtic in 1919 but moved to Blackburn Rovers shortly after. It failed to work for him at Ewood Park, and he returned to Stalybridge in February 1920 where he featured regularly for the senior side until he was signed by Manchester United in May 1923. He was unable to establish himself in United's league side making only three appearances and moved to Chesterfield in 1924, where he remained until 1928 making 166 league appearances and scored 6 goals. He then moved to Wigan Borough where his second season was a difficult one at a time when the club found themselves in extreme financial circumstances. Billy signed for Macclesfield in the summer of 1930 when he filled the left-back position throughout the season, only missing a handful of matches through injury, making the second highest number of appearances in all competitions. He played for Hurst from 1931 to 1933, and at the age of 37 joined his hometown club Mossley as trainer where he completed his football career. Also a professional cricketer in the Lancashire League. Only in his mid-fifties, Billy died in 1952. By the time Dennison signed for Macclesfield in November 1928 he had reached the veteran stage of his career which had taken him to Blackburn Grammar School, Blackburn Trinity, Blackburn Rovers, returning as a war time guest to Blackburn Trinity, Rochdale, Wigan Borough, Stalybridge Celtic, Stockport County, and Hurst. He played fairly regularly for the Silkmen throughout the remainder of the season at either centre-forward or inside-left. He scored a brace of goals on two occasions: the first in the 6-2 home win against Crewe Alexandra Reserves, and the second in the 4-2 home win against Northwich Victoria, both matches in December 1928. On leaving the Moss Rose he played for Barnoldswick Town and then Lytham finishing his career back at Stalybridge Celtic. Harry died 16 December 1947. Originally with Manchester City Juniors, Phil then played for Stalybridge Celtic as a teenager before signing for Amateur League side Avro. Signed for Mossley in February 1981 remaining with them until May 1983 making 124 appearances scoring 35 goals. Whilst there he was selected to play for the Northern Premier League Representative team, the FA XI Representative team and earned two caps with the England semi-pro team (now styled England C). Signed for Altrincham in the summer of 1983 and moved to Stafford Rangers in the summer of 1985 where he was the leading scorer in the 1987-88 season. Signed for Macclesfield Town in the summer of 1988 for a fee of £6000. Always an attacking player, Phil featured regularly in his first season and was often on the score sheet but opportunities were limited during his second season. On leaving Macclesfield Phil retired from playing football. In 2010 Phil played in the Manchester City Football Aid match. Having signed initially for the reserves, Mark had two spells with the Silkmen, with a short spell at Stalybridge in between. He moved to Northwich Victoria in 1974 later playing for Witton Albion and New Mills. A Scotsman by birth, William played for Vale of Clyde, Clyde (April 1921), on loan at King's Park and Cowdenbeath (September 1922) before moving to Huddersfield Town for the 1926-27 season where he made 34 senior league appearances scoring 14 goals. He then joined Liverpool (19 league appearances and 15 goals) moving to Heart of Midlothian in December 1927. Signed for Macclesfield in November 1928, he featured in the majority of the matches moving between centre-forward, Inside-right and inside-left regularly appearing on the score sheet in all three positions, completing the season as second-top scorer to Harold Kelly. As well as scoring on his debut he netted a brace of goals in three matches. William re-signed at Macclesfield for the 1931-32 season when he featured in two FA Cup matches scoring the winning goal in the second qualifying round replay. On leaving the Silkmen for the second time he moved to Bangor City (August 1932), Olympique Marseilles (October 1932), Boston United (August 1933) and Ashton National (August 1934). A French defender who was signed in January 2011 from Parisian side FC Municipal d’Aubervilliers, who he had signed for in the autumn of 2010, as cover for players recovering from surgery, having paid his own air fare for a trial with the Silkmen. Tony had come through the ranks at Nottingham Forest and was almost ever-present in the club’s FA Premier Academy in 2008-90 before graduating to their second string side where he played alongside former Silkmen, Emile Sinclair and Hamza Bencherif. After signing, during the second part of the the 2010-11 season Tony was almost ever-present in the starting line-up, showing his versatility playing at left-back, as a central defender and in the 2011-12 season, when he featured in more matches than any other player, as a left-sided midfielder. For Tony the 2012-13 season proved to be a complete contrast to his previous experience at Macclesfield. Steve King, in the main, preferred to use players who he had signed during the summer. It may well be that Tony did not fit into King's fast attacking style of football with the result that the only run of starts he enjoyed came the end of October and through November when Nat Brown and Kieran Charnock were injured. He scored the opening goal in the first round victory in the FA Cup at Swindon. In March 2013 Tony moved on loan until the end of the season to Lincoln City where former Macclesfield manager Gary Simpson had been appointed manager. Having been offered a new contract by Macclesfield, Tony elected to move to Morecambe during the summer of 2013 moving to Lincoln City in the summer of 2014. Signed a year-long loan deal with Macclesfield Town in the summer of 2015. Played at left-back for the opening matches of the season but reverted to his accustomed centre back role in the middle of September (following the signing of David Fitzpatrick) where he looked more comfortable. In December he suffered a back problem after which he was used sparingly but lost his place on the signing of John McCombe at the beginning of March 2016. Tony returned to Lincoln City at the end of the 2015-16 season but left them in the summer of 2016 to sign for Hemel Hempstead Town, moving to Barrow in September 2017 where he was released at the end of the 2017-18 season. Returned home to France when he signed for AC Boulogne-Billancourt in September 2018 stating that his time in England had built him as a man. One of many players given a short trial of two matches as a defender in Macclesfield's first season after the Second World War. He re-appeared at Macclesfield at the start of the 1950-51 season when he made the moved from the defunct Goslings club becoming a member of Macclesfield's reserve team and and was called upon to make two appearances in the senior side. Born in Scotland Jimmy was initially on the books of Buckie Thistle after which he made a single appearance for Stoke City before signing for Preston North End (as an amateur in May 1925 and as a professional for the 1925-26 season). He moved back to Scotland playing for Forres Mechanics and St Johnstone returning south to New Brighton (August 1927) where he made 56 league appearances scoring 15 goals. Bristol City signed him for a fee of £1,500 in December 1928 where he made 48 league appearances scoring four goals after which he played for Chester in the 1930-31 season. Signed for Macclesfield in the summer of 1931. A fast and skilful winger, he was almost ever-present scoring his fair share of goals in a high-scoring season for the team as a whole. Member of the 1931-32 Cheshire League Championship side and holder of a winner's medal for the Challenge Cup competition in the same season. On leaving Macclesfield he joined Chester for a short time before re-signing for New Brighton in September 1932 and then Llandudno in September 1933. Died in 1960 at a relatively young age. There is no information recorded for this player whose appearances came in February and early March 1895. A strong, no nonsense central defender, Luke’s career commenced in his native Malta with Sliema Wanderers, immediately winning silverware when the club won the Maltese Premier League. He spent seven seasons with the club and established himself in the national team with his first appearance on 28th April 1999 against Iceland, and in the friendly match against Armerina on 12th September 2007, he gained his 50th cap and became only the third Macclesfield Football League player to make an international appearance whilst a registered player of the club. Luke has been awarded a total of 78 caps to date in his international career having also appeared internationally in the Under 21 team. Luke then moved to the Irish side Shamrock Rovers for one season, returning to Malta with Birkirara. He moved to England signing for Mansfield Town in August 2003 where he remained for two seasons moving to Chester City in the 2005 close season and was released at the end of his one year contract when he returned to Malta. He signed for Marrsaxlokk for the 2006-07 season where he captained the team which won the Maltese title. Wanting to return to English football, he achieved his ambition when he signed a one-year contract with the Silkmen in the summer of 2007. Luke was released in the summer of 2008 when he returned again to Malta to play for Valletta. He moved on again in 2010, on this occasion to play for AEK Larnaca and to Mosta FC in August 2012 going out on loan to Valletta in 2013 and then signing for them permanently. To complete his career played for Sliema Wanderers for the 2015-16 season. A Macclesfield lad who attended Fallibroome High School. Jack was originally at Rochdale, signing as a first year apprentice for Macclesfield at the start of the 2013-14 season. A versatile player who can play at left centre back, left back, holding midfield or on the wing. Jack has a great understanding of the game and is a free-kick expert. Made his senior debut as a second half substitute in the first round of the Cheshire Senior Cup. Signed his first professional contract in the summer of 2014. At the start of the 2014-15 season Jack spent time on loan at Stockport Sports but on his return to Macclesfield his appearances were limited to the Cheshire Senior Cup competition where he gained a winners' medal. Played for Cheshire League side AFC Macclesfield during 2016-17 season and the early part of the 2017-18 season, signing for Congleton Town at the end of October 2017 and has subsequently signed for Congleton Vale Rovers on a dual registration basis. Holder of a winners' medal for the Cheshire Senior Cup when the Silkmen won the competition for the first time in 1889-90. At a time when the club were seeking a second 'keeper, Roy was signed from Winsford United where he was highly thought of, having previously been with Manchester City as understudy to Bert Trautmann. When Nathan spent a month on loan at the Moss Rose, he was a member of the Manchester City Reserve side which he had captained on a number of occasions. He made his Football League debut on his one and only appearance for the club as a central defender in place of the suspended Danny Swailes. Nathan was released by Manchester City in the summer of 2007 and subsequently has played for Rochdale and Hyde United, leaving Hyde in the summer of 2010. In 2012 was appointed a secondary school mathematics teacher at Dixons Academy in Bradford. Nathan is the twin brother of footballer Jonathan D'Laryea. There is no recorded information about this player. A much travelled goal scorer, Mick signed for the Silkmen from Farnborough for a fee of £3,000, half of which was met by the Supporters’ Club. His previous clubs had included Basingstoke Town (1982), Reading (1982-83), Slough Town (1983), Yeovil Town (1983-84). Wycombe Wanderers (1984) Weymouth (1984-85) where he scored 54 league goals in 102 appearances, Maidstone United (1987-88), Yeovil again (1988-89), Runcorn (1989-1990) and Farnborough Town (1990-92), on three occasions moving for a five-figure fee. He won a single semi-pro cap for England and won Championship medals in both the Isthmian and Beazer Homes Leagues. Mick signed for Macclesfield in February 1992 remaining until the end of the 1992-93. Whilst he could not attain his prolific scoring ability seen at many of his previous clubs, nevertheless he was a good team member and gained a Cheshire Senior Cup winners' medal in 1992. During his time at the Moss Rose he completed a two-year course in Leisure Management. On leaving Macclesfield he signed for Altrincham, and later played for Knowsley United, Runcorn (for a second time) and Bamber Bridge. On retiring from playing Mick has been employed as a football scout at a high level - Everton (late 2008-early 2009), Chelsea as European Scout (August 2011), Sunderland as Chief Scout (August 2016) and Celtic as First Team International/UK Scout (July 2017). Joined the newly formed Macclesfield Under 21 Youth Development team at the start of the 2017-18 season. Featured in the only Cheshire Senior Cup match of the season when members of the Development team were used to fulfill this tie. Remained with Macclesfield Town for the 2018-19 season as a member of the Under 18s team who were champions of the Mid Cheshire League Division One. An experienced utility player who, before moving to the Moss Rose, played for Port Vale from 1954 to 1960 (47 appearances, four goals), Exeter City during the 1960-61 season (40 appearances, six goals) and Chester City during the 1961-62 season (25 appearances). Whilst at Macclesfield he was an outstanding attacking player who featured regularly and was the Sportsman of the Year for the 1964-65 season when he was almost ever-present. Refused to re-sign at the end of the 1965-66 season and moved to Stafford Rangers. Away from football he was a self employed decorator. Came to Macclesfield from the Potteries but only appeared on three occasions as Wynne, and later Tatton filled the outside-right position on a regular basis. Donlan's goals came in the 2-3 defeat in the Second Round replay in the Cheshire Senior Cup against Middlewich. George's career started at Liverpool where he was a member of the youth set-up from 2004 to 2007. He then signed for Skelmersdale United where he made 45 league appearances scoring 36 goals. Moving to Plymouth Argyle in March 2009 he only made two substitute appearances but spent a short time on loan at Luton Town and two spells on loan at Stockport County for whom he made 42 league appearances scoring 12 goals. George signed for Fleetwood Town in January 2011 for an undisclosed fee scoring five goals in 25 league appearances. George holds one England 'C' international cap. Initially signed by Macclesfield in September 2011 on a month's loan. At the end of the loan George had to return to Fleetwood for three weeks, returning to the Moss Rose at the beginning of November 2011, so that his loan could be extended to the end of the year to conform with Emergency Loan regulations. He signed a permanent contract at the beginning of January 2012. Other than missing a few matches through a calf strain and a pulled hamstring, George featured regularly and completed the season as the side's top scorer with seven goals, two of which, against Plymouth Argyle and Crawley Town, came in added time to earn a draw. He also scored a fine solo effort to win the home match against Port Vale at the end of December 2011. George moved to Rochdale in the summer of 2012 for an undisclosed five-figure fee and to Tranmere Rovers for the 2014-15 season, but did not establish himself in the team and spent time on loan at Southport before his release from Rovers. Then spent some time back at Skelmersdale United during the 2015-16 season after which it would appear that he took some time out from football. George signed for AFC Liverpool in the summer of 2016 and in March 2018 moved to Marine having spent time in the Middle East as a personal trainer. George signed for Skelmersdale United in July 2018 for a third time, spending time on loan at Litherland REMYCA from October to December 2018. Before the First World War he played for junior clubs in the Stockport area. Enlisted in the Army on 15 January 1915 and spent three years three months in France. He was awarded a military medal for bravery but in a post-war interview he would not disclose the circumstances which led to the award. Whilst in the Army he captained the 7th King's Shropshire Light Infantry football team. He was demobilised in June 1919. He then played for Stockport County as an amateur and then for Mardy in South Wales, signing for Macclesfield on 20 January 1920. Ever-present from his debut to the end of the season with most of his appearances in the Subsidiary Competition, he scored two goals on his debut and the only hat-trick of the season in the 3-3 away draw against Chester on 14 April 1920. He gained a winners' medal in the Altrincham Cup competition in May 1920 to add to a Stockport Sunday League Championship and four Army medals. Returned to Stockport in June 1920 re-signing for Macclesfield in January 1921 when he only featured in three end-of-season matches after which he signed for Ashton National in the summer of 1921. A Blackpool trainee who moved to the professional ranks there in October 2004 but did not make a senior appearance for the seaside club in three years, although he did experience first team football on loan at non-League Leigh Genesis in the 2005-06 season and later Barrow. Phil spent six weeks on loan with the Silkmen playing at centre back, but was recalled to Blackpool in January 2008 and shortly after went on loan to Accrington Stanley for a month. Signed for Fleetwood in 2008, and whilst there spent time on loan at Welshpool Town and AFC Fylde where his loan was converted to a permanent transfer in the summer of 2009. Having been on loan at Bamber Bridge in 2012 he moved there permanently in 2013 moving to Nelson in the summer of 2015. Returned to Bamber Bridge in the summer of 2016. Before his moved to Macclersfield Geoff had played for Kirby Town, Altrincham, South Liverpool, and Runcorn. Quickly settled into the side with many of his appearances coming in the second half of the 1972-73 season including gaining a winners' medal in the Cheshire Senior Cup. Having been released by Macclesfield Geoff signed for Mossley in the summer of 1974. Peter’s only other senior appearance came in the match immediately following his debut in the Cheshire Senior Cup Semi-final at Nantwich Town. There is no information recorded for this player whilst at Macclesfield but he was a member of Langley FC during the 1882-83 season. Promoted to the senior side from Macclesfield juniors. After leaving Blackburn Rovers where he had been a trainee, Robbie returned to Ireland playing for a number of Irish League clubs as a striker and earned one cap for the Ireland Under-21 side. Robbie was signed by the Silkmen in the January 2007 transfer window, but only made two appearances from the substitutes’ bench, the first of which was his Football League debut, giving him little opportunity to make any real impact, and was released at the end of the season. Subsequently he returned to Ireland where he has played for Dundalk, Sporting Fingal and Bray Wanderers. Robbie has retired from playing football and is a model and solo artist. Had previously been on the books at High Green Athletic and Lincoln City. He played in the early season matches for Macclesfield and for the reserve side during a trial period, after which he was released. Ross started his career at Shrewsbury Town where he was a regular in their youth and reserve sides before joining Stafford Rangers. At his next club, Hednesford United (season 2008-09), he made a string of impressive performances, appearing for the Pitmen 50 times scoring nine goals at a time when he was captain of the side. 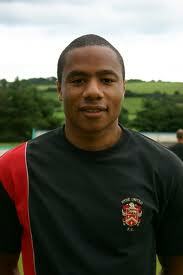 His performance at Hednesford led to Keith Alexander signing him during the summer of 2009. Ross made an immediate impact as a totally committed player who always gives 100% in every match as a no-nonsense tackler. Also, as the season progressed, displayed his versatility playing across the midfield positions. However, Ross missed several games in the second half of the season following a double hernia repair and then an ankle injury but having recovered became an integral and influential member of the side. In the 2010-11 season Ross was almost ever-present and continued to be an extremely influential member of the side in the centre of the midfield. 2011-12 proved to be mixed season for Ross, when he was suspended in December and at the end of that month sustained a fractured metatarsal which required surgery, keeping him sidelined for three months and only able to return for the closing matches. Although offered an extension to his contract, Ross elected to move to SPL side Inverness Caledonian Thistle in the summer of 2012. Having made over 200 appearances for Inverness Ross signed for Ross County in the summer of 2017. A native of Braemar, Scotland he was the regular first choice 'Number 10' throughout his two years with the club. Holder of a Cheshire Senior Cup winners' medal for the 1895-96 season. May well have been on the books of Northwich Victoria during the 1892-93 season and was playing with Newton Heath in January 1903. Roy was signed at the beginning of February 1973 from Crewe Alexandra where he had gained league experience over three years. A member of the reserves who was a hard worker and always stayed cool and calm. Drafted in for this match when several senior players were out injured. John joined from Oldham and was the quiet man of the team. He was known not only for his skilful control of the ball, but also his determination to win at all costs. Able to play in both midfield and defence, his one goal came in the 3-0 home win against Workington. A product of the Bury youth team by January 2017 he had made 12 appearances for Bury in all competitions since 2013. Two loan spells in 2015 and 2016 at National League side Guiseley saw him make 18 appearances in all competitions scoring eight goals including the goal which staved off relegation for Guiseley. Signed on loan at Macclesfield Town in January 2017 until the end of the 2016-17 season as part of the transfer deal when Jack Mackreth moved from Macclesfield to Bury. During his stay at Macclesfield Anthony was often used to give other players a break from playing and, when required, filled the lone striker role, a managerial policy at Macclesfield. Unfortunately his loan spell was interrupted for just over a month with a hamstring injury which he sustained in the third round of the Buildbase FA Trophy against Forest Green Rovers at the beginning of February, nevertheless he played a useful part scoring five goals in his 17 appearances. Out of contract at Bury, Anthony signed for Salford City in the summer of 2017. In July 2018 signed a season long loan with FC Chester rejoining former Salford City managers Bernard Johnson and Anthony Morley. A trainee at Manchester City, Terry made one Premier League appearance from the substitutes’ bench for City, before moving to Bury in August 2002 initially on loan and then permanently where he made over 80 appearances in all competitions, but a serious injury then kept him out of the game for two years. However, as Terry lived in Macclesfield, he was invited to the Moss Rose for a trial prior to the start of 2007-08 season and impressed sufficiently to earn a contract. Terry is Canadian born and has represented Canada at Youth and Under-23 levels and has also represented England at Youth level. Terry was almost ever-present during the 2007-08 season, enthusiastically covering every blade of grass, and was voted Player of the Year. Despite being offered improved terms he elected to move to Shrewsbury Town in the 2009 January transfer window. In 2010 played for Vancouver Whitecaps in Canada and in 2011 Toronto FC but was released by them in 2013. Had a short spell at Oldham Athletic from February 2014 to the end of the season. Leaving Oldham at the end of the 2014-15 season, Terry signed for Ross County in the summer of 2014 but was one of several players released at the end of the 2014-15 season. For the 2016 season Terry signed for Toronto Atomic in the Canadian Soccer League. Currently Head Coach of Toronto FC Academy Under 14 team. In addition to playing for the England Under 18 team, Terry has also played for Canada at Under 20, Under 23 and full international levels. There is no information recorded for this player. His known appearances came January/February 1901 with his one goal scored in the 8-3 win at Prestwich. A regular in the team and captain, he perfected the one-arm throw-in before the two handed throw-in rule was introduced in 1882. He represented Cheshire at County level and captained the team. Inherited the directorship of a silk mill and for the friendly match against Preston North End in 1891 presented the team with silk shirts. John's career started at Newton Heath Loco and Ashton National. He signed for Manchester United in June 1933 and then Stockport County (July 1934) and Barrow (May 1935). Signed for Macclesfield in the summer of 1936. Whilst appearing on a fairly regular basis, John had to share the outside-left position with Fred Taylor throughout the 1936-37 season. He scored the winning goal on two occasions in league matches, and scored the goal in the 1-1 draw against Buxton in the third round of the Challenge Cup, Macclesfield winning the replay going on to compete in the semi-final. After WW2 played for Northwich Victoria (30 March to 27 April 1946) and then played one match for Witton Albion on 8 November 1947. Kieron played for Runcorn and Cheshire Schoolboys, signing schoolboy forms for Wrexham at the age of 14. From 1992 he had a four year professional term with Wrexham when he won three caps for the Republic of Ireland and also won a Welsh Cup winners medal in 1992. In 1996 Kieron moved to Stockport County for a fee of £95,000 and then signed for Macclesfield in March 1998 for a fee of £15,000. Usually he played on the right flank, however, there were times when he successfully partnered Richie Barker as a striker. A good tackler, he often beat defenders to provide pin-point crosses and was a dead-ball expert. Whilst at Macclesfield gained a winners' medal in the Cheshire Senior Cup in 2000. Kieron moved to Rochdale in the summer of 2001 and subsequently played for Swansea City, and then moved into non-league football with Caernarfon Town, Runcorn FC Halton, Leek Town and Cefn Druids. On retiring from football Kieron became a PCSO in Widnes. Died in February 2018 at the age of 44. With Telford United under-19 side in the first half of the 2007-08 season graduating to the senior side in January 2008. He spent time on loan at Rushall in February 2008 returning to Telford United where he remained until signing for Hednesford Town in August 2008. Elliott left Hednesford Town for Evesham United in January 2012 but returned to Hednesford Town in July 2012 remaining there until January 2014 when he signed for Wrexham having made 152 appearances in his two spells with the Pitmen and was Player of the Season at the 2014 NPL Player of the Year awards. He then played for Tamworth (July 2015) and Chester FC ( July 2016) where he made 46 league appearances scoring eight goals during the 2016-17 season. Elliott was also given the opportunity to be a part of Leicester City and England striker Jamie Vardy’s V9 Academy aimed at giving more opportunities to Non-League footballers. Signed a two-year deal with Macclesfield Town in the summer of 2017. Was a regular member of the team only missing three matches in August due to injury after which he was ever-present until he picked up an injury in the home match against Gateshead towards the end of March which unfortunately ended his season. He played with pace on the right wing, proved to be a brilliant crosser of the ball and contributed nine goals, the third highest season scorer making him an intricate part of the championship winning team of the Vanarama National League in 2017-18. Included in the National League Team of the season. In 2018 as part of the 50th Anniversary celebrations of the formation of the Northern Premier League (now the Evo-Stik League) a vote was held to find the top 100 players in the NPL in which Elliott came 12th. #Known appearances and goals. Due to the style of reporting there is no information for teams/goal scorers for some matches and in other cases it has only been possible to extract part teams from match reports. Also, some matches over the Christmas and Easter holiday periods, together with end of season matches, have not been reported.